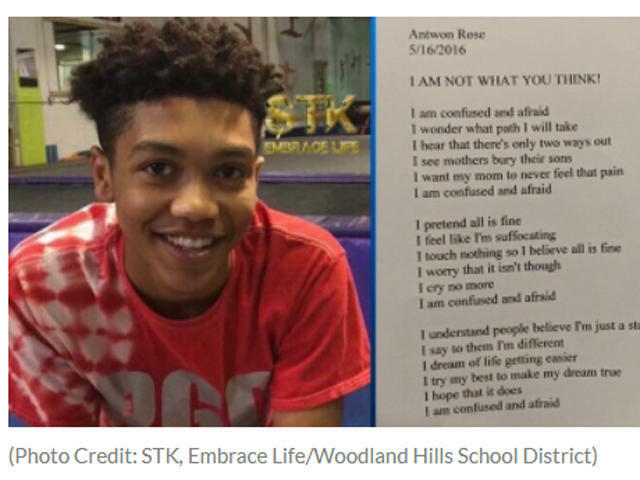 PITTSBURGH -- During a downtown rally Thursday for Antwon Rose Jr., the teen killed by East Pittsburgh police late Tuesday, a poem written by Antwon was read, reports CBS Pittsburgh. The Woodlands Hills School District released it. "His mom, Michelle Kenny, wants everyone to have it," Superintendent Licia Lentz said in a message. Rose reportedly wrote the poem two years ago during a 10th grade Honors English class at Woodland Hills High School. The poem, titled, "I AM NOT WHAT YOU THINK!" describes Rose's fear of violence in his community. One line reads, "I see mothers bury their sons; I want my mom to never feel that pain." The officer fired three shots at Rose, hitting him in the back and killing him.